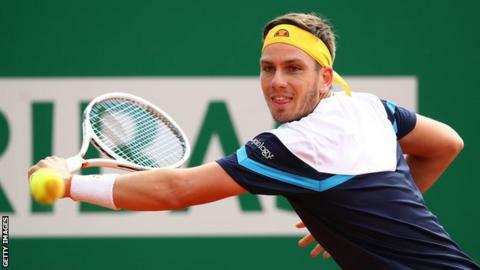 Cameron Norrie recovered from three games down to beat Marton Fucsovics and reach the Monte Carlo Masters last 16. British number two Norrie, 23, beat Hungary's Fucsovics 7-6 (7-3) 6-3 in one hour and 46 minutes. He will play Italian world number 96 Lorenzo Sonego in the next round. Defending champion Rafael Nadal, who had a bye for the first round, made light work of beating fellow Spaniard Roberto Bautista Agut 6-1 6-1. Earlier, Briton Jamie Murray and Brazilian partner Bruno Soares reached the quarter-finals in Monte Carlo, defeating Edouard Roger-Vasselin of France and Bosnian Ivan Dodig. The third seeds won 7-6 (7-5) 6-7 (4-7) 10-8 and will play the winners of the tie between John Peers and Henri Kontinen, and Diego Schwartzman and Joao Sousa. Analysis and opinion from the BBC's tennis correspondent. How to get into tennis - it's fun, will keep you fit and caters for all levels and abilities. Find your nearest court and learn the basics with our guide. Get the latest tennis headlines sent straight to your phone, sign-up to our newsletter and learn where to find us on online.